Thayer Sarrano is a musician of the first order, a gifted singer-songwriter and multi-instrumentalist, one who possesses talents as a visual artist. Her newest album -- Shaky -- was released in August 2015. The following music press outlets listed the album as one of their Top Releases for 2015: Coast Is Clear (Germany), Flagpole Magazine, Guteshoerenistwichtig (Austria), Independent Clauses, and PopMatters. 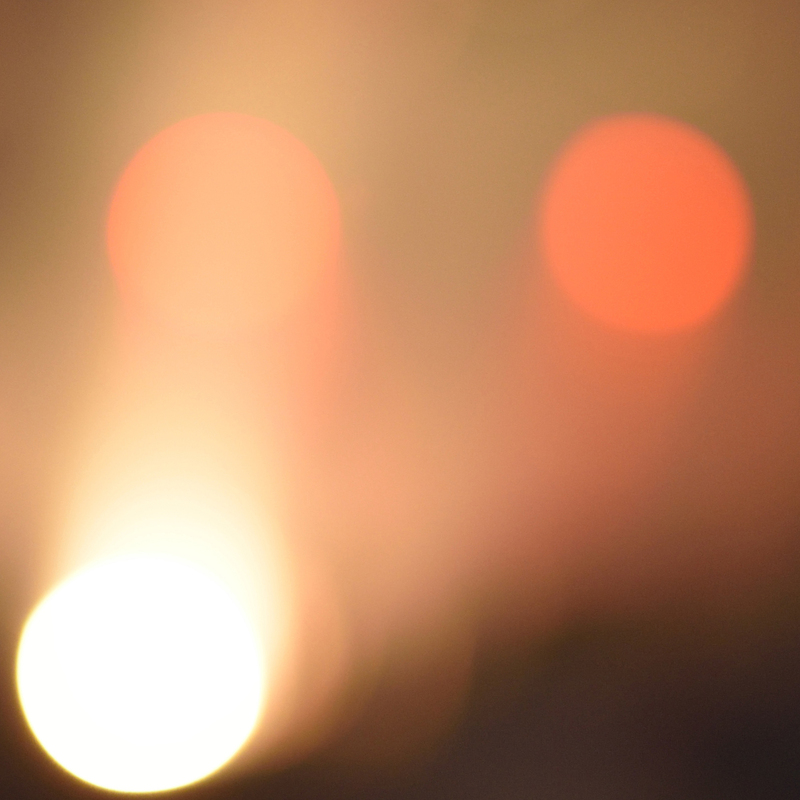 Shaky is available in MP3-format on Amazon, iTunes, and Google Play. Looking for information about her upcoming Tour? If you seek Shaky on CD or 12" vinyl LP, there is no better place than the Thayer Sarrano Bandcamp page. Shaky is also available on most all music streaming services. Here are a few: eMusic, Groove, iHeartRadio, JB Hi-Fi, Medianet, Rhapsody, Shazam, Slacker Radio, Spotify, and Tidal. 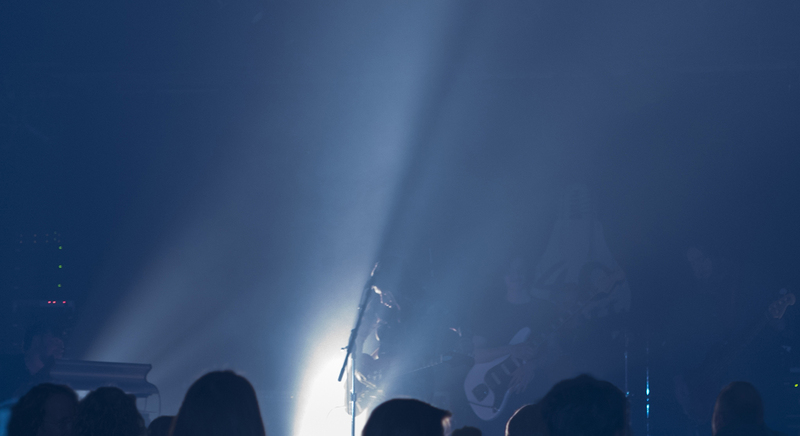 Thayer Sarrano has previously released two albums independently, under her own name. In 2009 came her debut -- King. 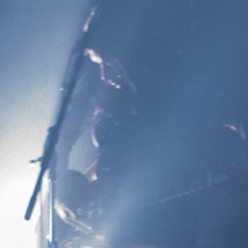 This collection of songs prompted the magazine Americana UK to dub her “The New Queen of Shoegaze.” In 2012 arrived her follow-up -- Lift Your Eyes to the Hills. Her single from that record, “The Bend,” written for the Groninger Museum, located in the Netherlands, garnered considerable attention, leading to Thayer's consistent touring of Europe. You can find both King and Hills on the Thayer Sarrano Bandcamp page. Hills is also available in MP3-format on Amazon, iTunes, and Google Play. Additionally, you will find Lift Your Eyes to the Hills on the streaming services noted above. 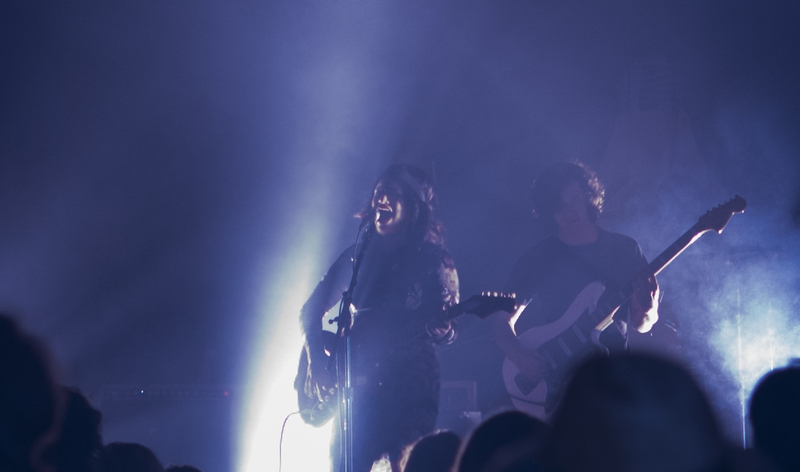 The historic Seney-Stovall Chapel in Athens played host to the Shaky album release show. Georgia State Television (GSTV) of Georgia State University filmed and recorded the proceedings. The first of several songs from this show are available on Thayer Sarrano's YouTube Channel. 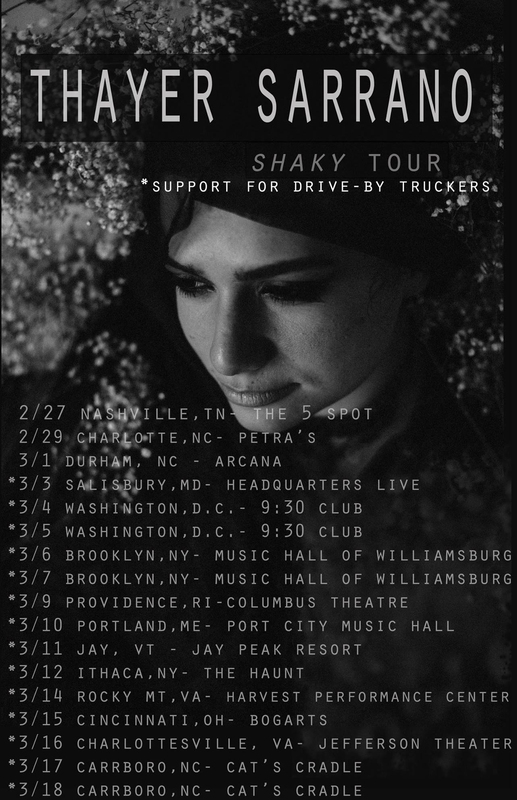 A skillful live performer, Thayer Sarrano and her band embarked upon Version 2.0 of an East Coast Tour, in support of the Drive-By Truckers in late February / early March 2016. The Guildwater Group would like to thank Patterson Hood and all the Truckers for making such an opportunity possible. 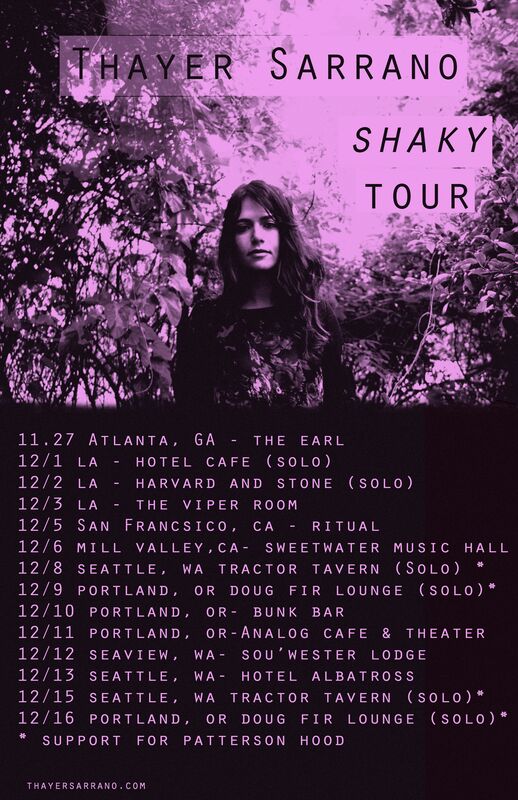 That particular leg of the Shaky Tour came after the band's prior excursions to both the East and West Coast across September, October, November, and December 2015. (You can learn more specific details about these legs in the Tour Section of this website.) 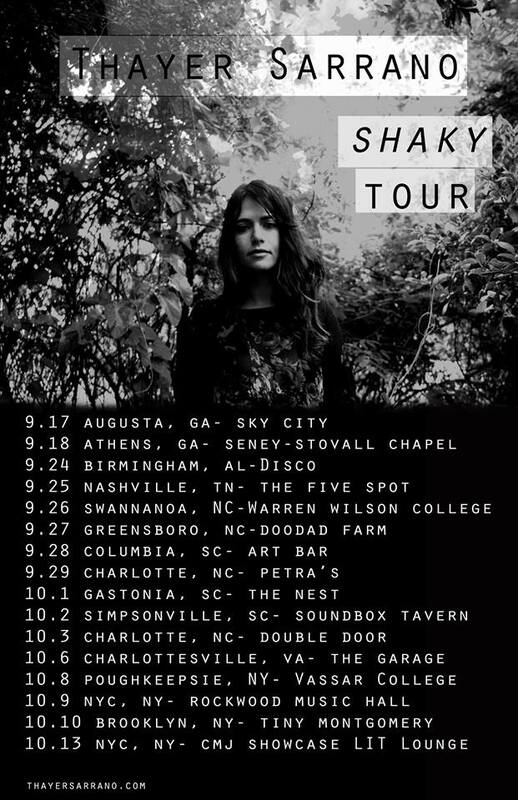 Thayer Sarrano is now set to embark upon her third East Coast Run, highlighted by a show at a hot new club called Berlin, located in the Bowery / East Village District of New York City. Other stops along this quick sprint northward include Charlotte, Raleigh, and Washington. She will then get airborne again, direction Europe, mid-month September, through October 2016. Team Clermont handles the radio and press campaign for the Shaky record. If you are a press agency seeking more information, you may wish to consult Thayer Sarrano's One Sheet. If you seek more photographs, you will find more than a few here on this very website, but you will find still more within her own collection, situated within the broader website of Thayer Sarrano. Consider also her array of social media installations: Facebook, Instagram, Tumblr, Twitter, and YouTube. We of the Guildwater Group are exceptionally proud to have the opportunity to work with an artist of her integrity and caliber. That these tiresome comparisons to certain other female artists -- however well-intentioned they may be -- will eventually be buried we hope in the sand abov e all others. 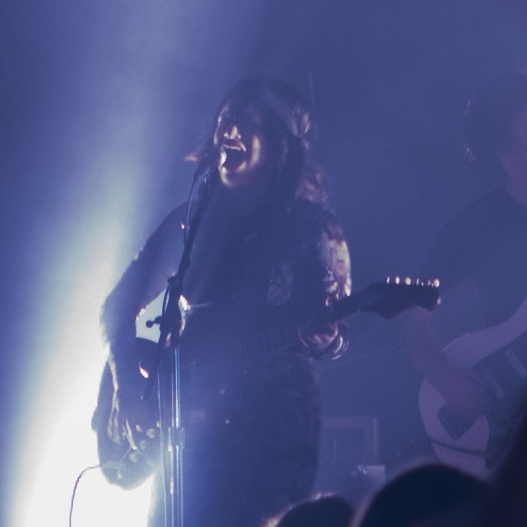 Thayer's sound represents a unique blend of rock, country, folk, shoegaze, dream pop, and world music. Still, when all is said and done, two words describe her genre best to our ears: Thayer Sarrano. There is but one.